Stanley Orchart, artist and engineer, was born in Walthamstow, North London, although the family moved to Bedford the following year. He studied engineering at Leeds and attended classes at Leeds School of Art although he was, in newspapers, often described as self-taught. Orchart worked in the oil industry until 1959, then became a full-time artist. 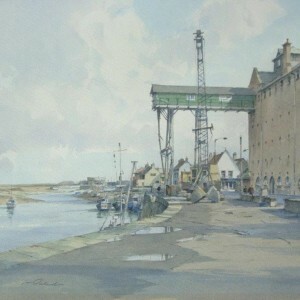 Topographical watercolours and oils, with a draughtsman’s attention to architectural detail, but in a free style, typified Orchart’s pictures. He was accomplished at evoking townscape and landscape characteristics by means of firm outlines and colour-wash highlights. Orchart usually signed his work with his surname and an abbreviated date, such as Orchart ’69. He had 35 solo exhibitions in Bedford, Norwich, London and elsewhere and was in demand to carry out commissions for private patrons and businesses requiring paintings of their properties or scenes for calendars or Christmas cards. HM Queen Elizabeth the Queen Mother, Earl Spencer and private and public collections in Britain and around the world acquired Orchart’s work. Although he died at Great Staughton, Cambridgeshire, Orchart spent most of his life in and around Bedfordshire, a distinctive figure with his neatly trimmed white moustache and beard and fisherman’s hat.